While inconvenient to carry when it’s raining, I don’t think it’s possible for an umbrella to ever truly be hands-free. No matter what the good people at Hammacher Schlemmer try and tell you. 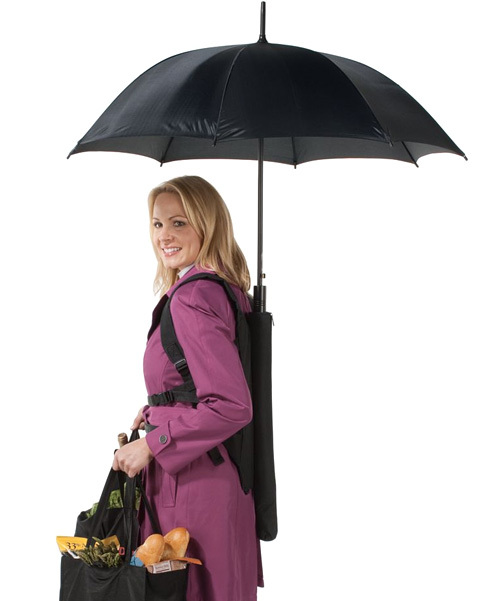 This backpack umbrella they’re now selling definitely looks like it lets you carry groceries or box kangaroos while staying dry, but I can only see it working if you live on a deserted planet where the wind never blows during a storm. Because whenever I’m walking with an umbrella here on Earth, I’m constantly fighting to keep it stable in stormy gusts, and preventing it from banging into other people. I like the idea…but it wouldn’t work. There’s always wind when it rains. The rain just doesn’t drop down. It swirls because of the wind. So if the company can make an umbrella that can cover you depending on how the rain is dropping with accordance to the wind, it’s not going to sell much. You might have a harder time with this umbrella not unless you’re a child wearing it.